Whether you’re buying your first chest freezer or replacing an old one, there are many factors to consider before making your purchase. 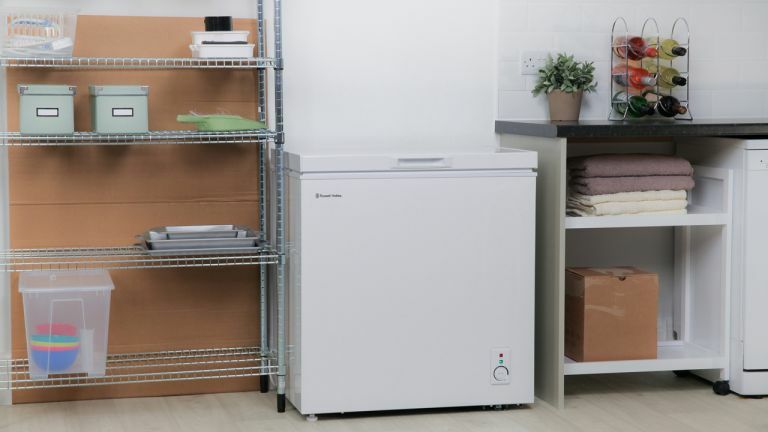 Chest freezers offer more useable space than regular freezers, and for the most part, they're normally cheaper; however, they're a large appliance that you can really only fit into a spacious utility room or attached garage. However, if you cater for a large family and like to cook and freeze ahead (or just stock up with a big weekly supermarket shop), having one is a practical move. Our guide to the best chest freezers takes you through the best options on the market. Looking for more new kitchen appliances? Head over to our kitchen appliances hub page for more buyer's guides. With compact models to suit smaller households and extra large ones to suit big families, choose your freezer based on its capacity first. Ranging from around 100ltrs to the 300ltr mark, those who live in a couple or on their own can easily get away with a chest freezer that's 100ltrs; medium sized households will be able to survive with 150ltrs to 220ltrs; and anything above will be plenty for larger households. You've probably already nominated the corner of a large kitchen, a utility or a garage for your new chest freezer, but bear in mind that some chest freezers can't be housed in unheated spaces, so check before you buy. The top energy rating is A+++; the higher the rating, the lower your utility bills will be. A deal breaker for some, a lot of chest freezers don't have auto defrost, meaning that every once in a while, you'll have to manually defrost the freezer. If you often buy large joints of meat or simply have lots of mouths to feed, then a chest freezer could be the answer. This Russell Hobbs chest freezer has an impressive 146 litre capacity, offering enough freezing space for a medium-sized family's weekly food shop. It has one large freezer compartment, perfect to easily find what you're looking for, although for those who like things organised, this might be a negative; however, there is a wire basket to store items that are most frequently required. The freezer also features a lid top that balances on its own when opened; there's also an adjustable thermostat giving you complete temperature control. It can be stored outside (and has adjustable feet, handy if it's going in a shed or garage with an uneven floor). In our opinion, this is the best chest freezer you can buy. Somewhat larger than our first choice, this Indesit OS1A200H2 has a capacity of 204ltrs – or 11 bags of shopping – making it the second largest on this list, and ideal for a medium-sized household. This chest freezer has an integrated dual cooling system, so it can be used as a freezer or a cooler, depending on your needs. There are also a few extra add-ons, such as a lock on the outside. There's also a temperature warning light and a fast freeze function, which locks in the vitamins of newly purchased food by dropping the temperature of the freezer once anything is added. Our only complaint? Just like several other chest freezers, this one needs to be manually defrosted. One the upside, this model in particular is easy to defrost as it has a screw-cork for drainage. The best chest freezer for large families, the Miele GT5284S has the biggest capacity on our list at 301ltrs. Although large, it's surprisingly quiet, and also has a highly efficient with an A++ energy rating. Inside, there are three handy basket compartments and a light; the SuperFreeze technology drops the temperature of the chest freezer to -18°C to freeze newly-added items quickly. A removable freezer tray is useful for freezing small items such as berries or herbs and prevents them sticking together; this tray can also be used as a dividing wall to create a separate freezing section. The safety lock provides extra peace of mind. It's worth noting that this chest freezer can't be kept in an unheated area. Want a chest freezer but don't have the space for a large design? This Candy model is a compact buy at under 60cm wide, but it can still hold five bags of shopping – enough for a small family. Quiet for a chest freezer, it has a decent energy rating, too. Designed with practicality in mind, there is a handy wire basket at the top, that allows you to keep smaller and more frequently used items together for easy access, while at the bottom, you will have plenty of space for large items. Other features include a warning light which comes on if the temperature changes dramatically, and a counterbalanced lid. This chest freezer can be kept inside or in an outbuilding, and it's available in black and white. You can store this chest freezer in rooms as cold as -15°C thanks to its WinterGuard feature, making it the ideal option for those who need an average-sized chest freezer on a budget that can also be stored outside. It can hold up to 10 bags of shopping at once, has a basket inside, has an efficient A+ energy rating and a counterbalanced lid to keep it from slamming shut. To keep it working at its best, it’ll need manually defrosting every so often. The best chest freezer if you're on a budget, we think. Looking for more fridge-related tips?